Over the past couple of weeks, we have been working towards finalizing the rudder addition. 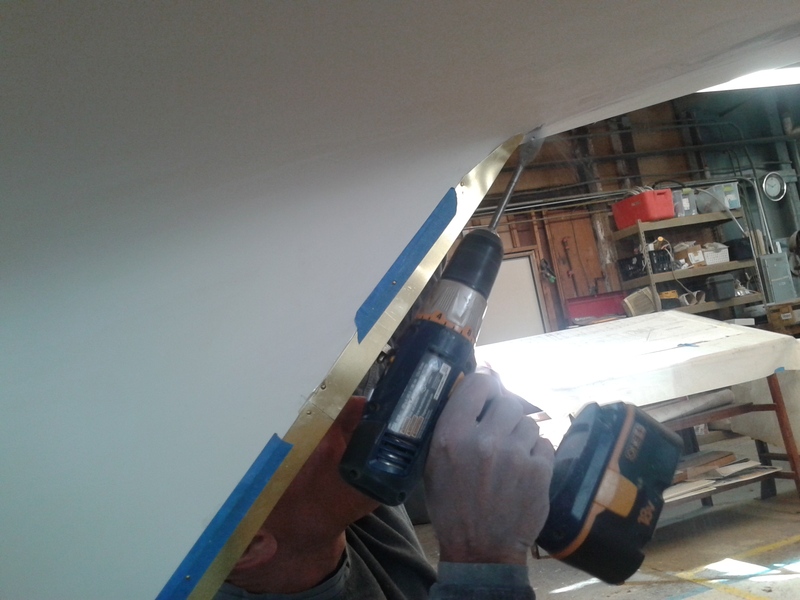 In the last blog post, you all saw Keith’s work at setting up the the set of pintles to the keel. Since then, the crew has added metal borders to each side of this pintle set. These borders were meant to keep the RELIANCE hydrodynamic when using the rudder. 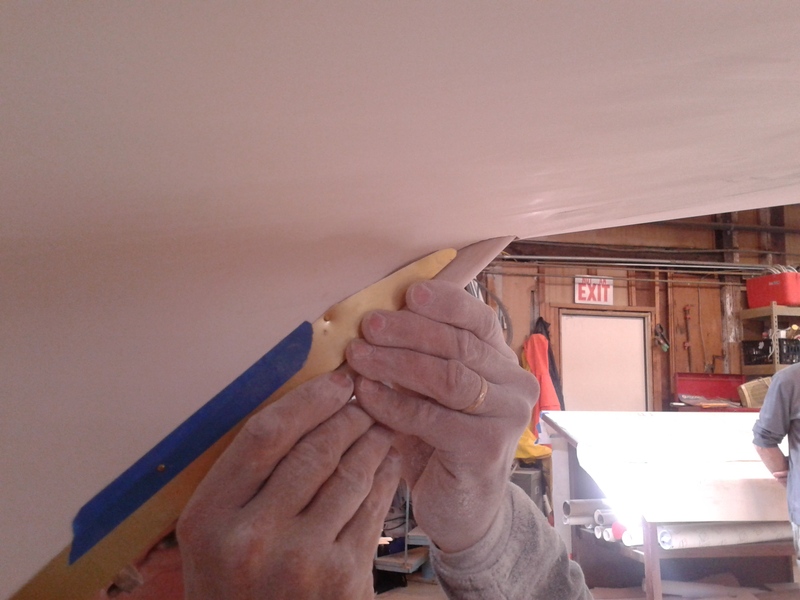 Afterwards, Bern got to work drilling and filing a hole into the bottom of the hull for the rudder’s stock to fit into. 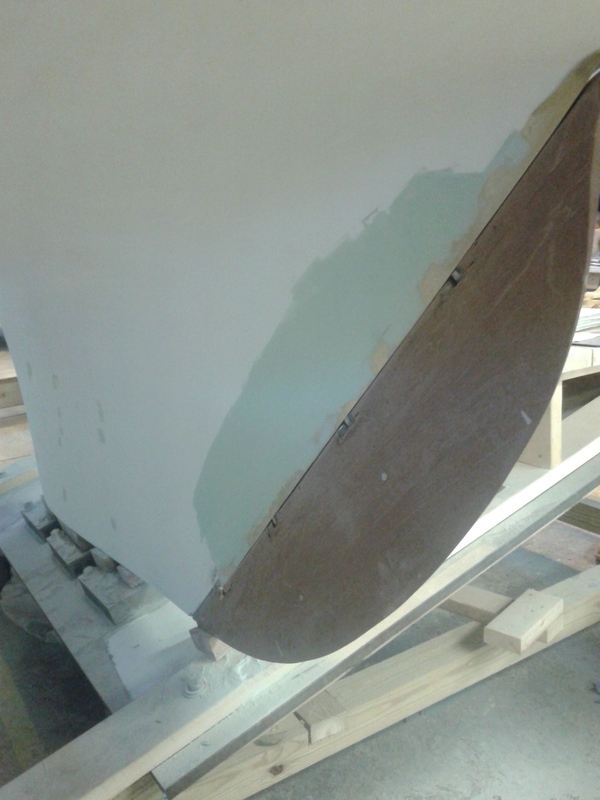 While this was being set up, Sandy and Zach spent time sanding the rudder’s stock in order for it to fit perfectly. 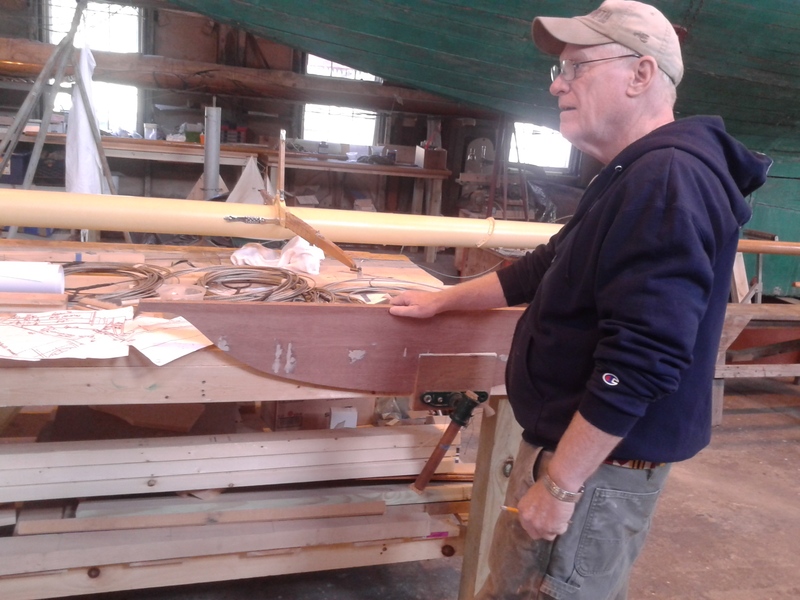 This entry was posted in Project Manager's Welcome and tagged A Team, bern, bondo, Bristol, building 28, gudgeons, Herreshoff, Herreshoff Marine Museum, HMCo, hull, keel, pintles, RELIANCE, Reliance Model, RELIANCE Project, rudder, Sandy Lee on October 24, 2015 by Herreshoff Marine Museum/America's Cup Hall of Fame. 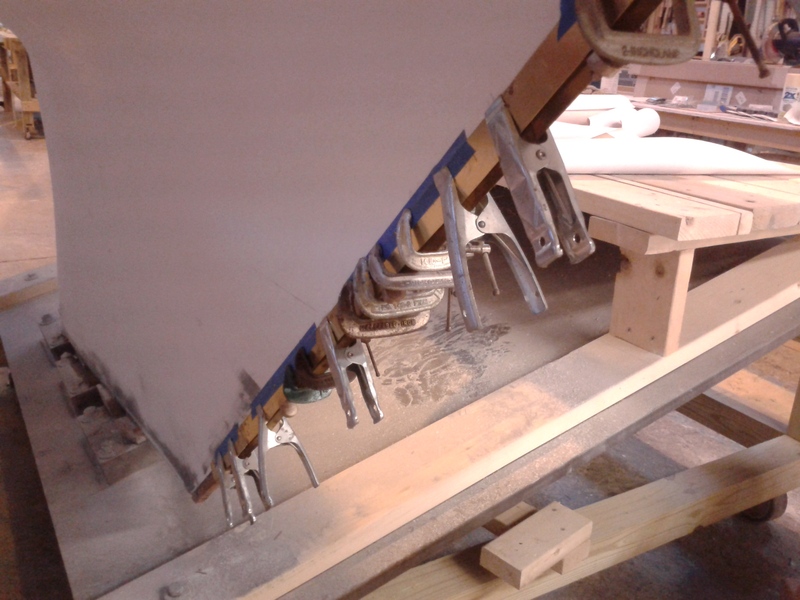 We’ve now got the topmast lodged onto the rest of the mast’s body, with Herb working on some rigging details. While slaving away in his lonely corner of Building 28, Herb noticed an error on the spreader’s rigging: one of the wires was too short. Fortunately, he was swift to correct the wiring, and has since progressed on the spreader/mast system. 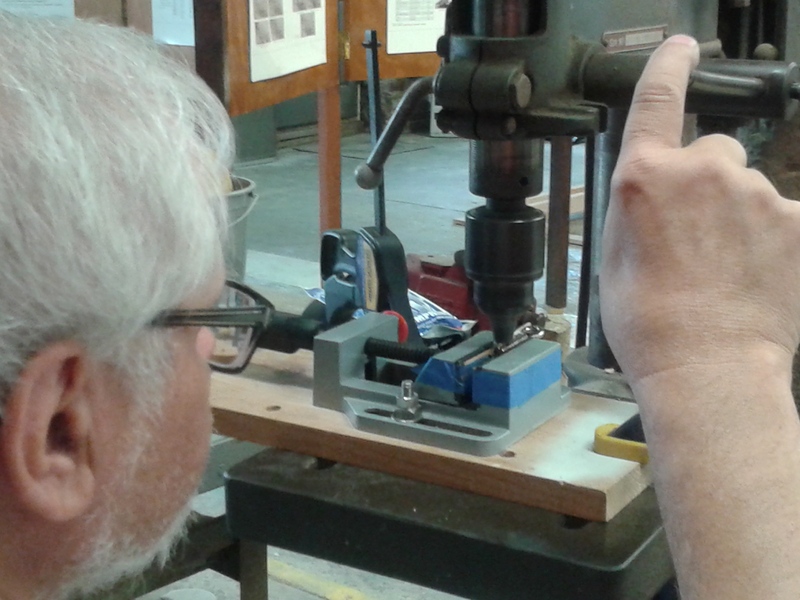 Keith is beginning the process of attaching the rudder to the model. 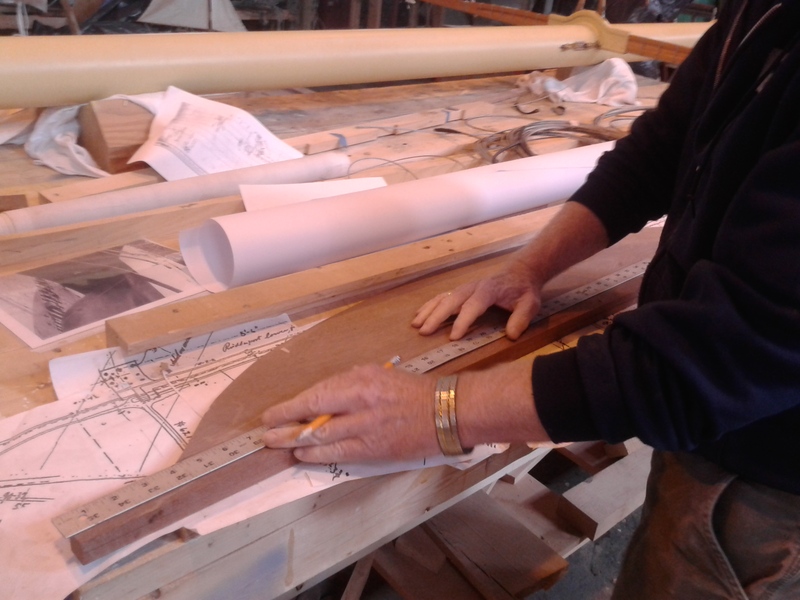 He’s screwed a long metal piece–a set of gudgeons–to the back of the keel; the rudder will be pinned to this piece by a series of pintles. 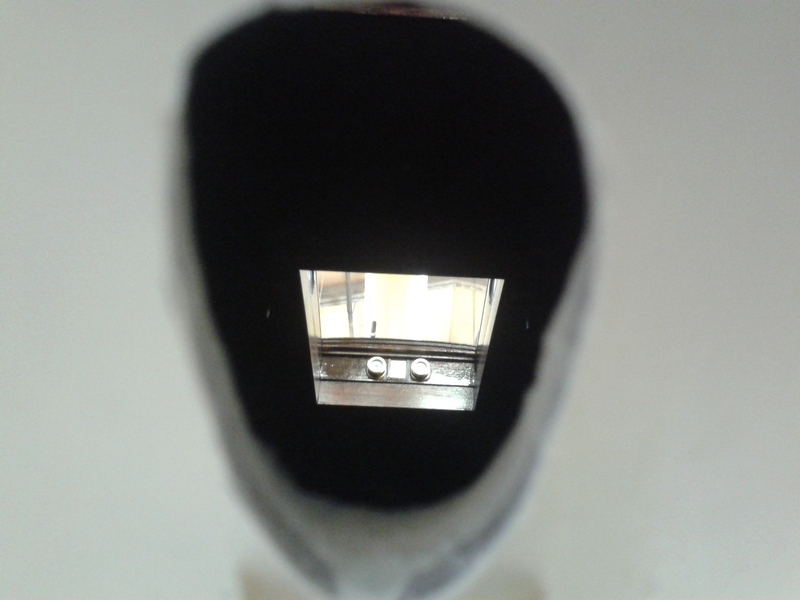 An interesting fact we discovered is that the RELIANCE’s rudder was actually held up by a bearing attached to the lower part of the ship’s hull. Still figuring out how we’re going to work that into the design. 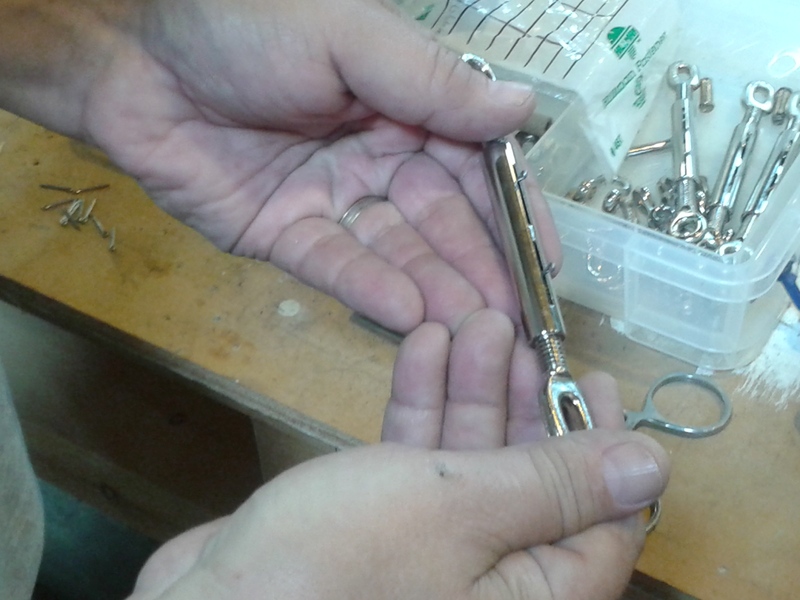 Meanwhile, Steve is working on setting up turnbuckles to be plugged and added to the overall structure. This entry was posted in Project Manager's Welcome and tagged America's Cup, Bristol, building 28, gudgeons, herb, Herreshoff, Herreshoff Marine Museum, HMCo, hull, Keith Bradley, laura, mast, pintles, RELIANCE, Reliance Model, RELIANCE Project, rigging, rudder, spreader, steve, topmast, turnbuckles on October 2, 2015 by Herreshoff Marine Museum/America's Cup Hall of Fame.